Congratulations to Naomi Blackburn! 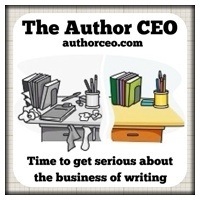 The Author CEO now has its own site at authorceo.com, where Naomi will be posting her latest articles, plus quotes, links to useful/interesting pieces etc. Be sure to stop by! We’ll still be posting excerpts from Naomi’s pieces here but visit the site for the full articles. It’s worth it! Recently, Donna Brown sent me a link to a new product on the market—a review accelerator program that drills Amazon reviewer profiles to develop a list of potential reviewers. Two things came to mind as I looked at the product. First, the concept fascinated me as I found it to be an excellent product if used correctly. Problem is, I suspect that most authors simply follow program recommendations rather than using the tool wisely. Second, it explained a whole lot of spam review requests I have been receiving. A new badge for a new home! I think I can speak for most, if not all, reviewers when I say I hate getting spam review requests. Normally, after reading the first sentence I pitch such requests into my garbage can. If the author hasn’t taken the time to identify who I am as a reviewer, why would I read his/her book? Not to mention, why would any author send his/her book to someone who doesn’t want to read it? Donna also sent a link to a post detailing the horror story of an author who paid a huge price for an error in judgment. The author utilized a mail merge program to send out review requests; due to a “serious malfunction,” multiple requests were sent to each recipient. Reviewers reported her to Amazon; labeled a spammer, the author lost her ranking, damaging or possibly even ending her entire writing career. It is important that authors recognize that these programs are tools as opposed to the end all; authors should control the program, not be at their mercy. Let me give a sales example. Customer Relationship Management (CRM) or Sales Management programs/databases are commonly used in business. These databases give sales professionals a way to generate and house customer information, plus the ability to drill down into data to make smart business decisions based on data gathered from the program. By no means do sales/business professionals take information generated by the reports as gospel. Further research, analysis, and application criteria are considered in order to avoid costly business mistakes. Authors: Have you used review accelerator programs to find lists of reviewers? Do you mail them individually or send bulk emails? What has worked best for you? Reviewers: What do you think about these programs? How do you respond to bulk emails? Does an individualized pitch make you feel more inclined to review? Looking for reviewers? Try these great lists as a starting point. Insatiable Booksluts: Getting your book reviewed: How to sell us on reviewing your book. Insatiable Booksluts: Getting a blogger to review the book you wrote, part deux. Naomi Blackburn presents here the new reality of indie publishing. Like many other technological evolutions that launched “gold rushes”, Amazon and other companies have made it possible for anyone to get published and nearly everyone has. There have been many, many complaints about the veritable vortex of market confusion that has arisen as 300,000 new books are published every year only to be read (and only partially) by the authors’ mothers. If you want to make money writing you have to confront the reality that your writing is merely a product subject to all of the same business considerations that apply to any other product. In other words, products do not sell themselves. They need an entire business structure surrounding them that provides tools to expand market penetration like public relations, marketing, advertising, product development, market feedback and the like. Amazon may have created a method by which everyone can release their inner Hemingway, but unfortunately, it has not provided a method for the masses to release their inner Simon & Schuster or Harper & Row. The large publishing houses did way more than just print books. They had massive marketing departments and distribution networks that funneled books into the hands of readers. The idea that you can write a great book and become successful simply by publishing your book through Amazon is beyond naive. If you have an agent and a publisher, you might get away with being a lone author writing in a rustic cabin in the woods. In the indie publishing world, however, for every hour you spent writing you have to be prepared to spend 100 hours marketing. A quality product counts, but it is only a small part of what it takes to make a book a success. Any quality product in an over-saturated market gets lost with the garbage. Until the market organizes itself so as to distinguish and stratify indie literary products by value, it will remain, for most of us, a long and unlikely path to the top of the heap. The literary industry used to have clearly defined pathways. They were called agents and publishing houses. Their primary job was to sift through the ramble and locate the gems. Unfortunately, this system was biased and limited entry because it was controlled by the same stodgy gatekeepers. The reality check here is that democratic revolutions do not always bring fair and free markets. Sometimes, they create chaos. The Author CEO makes a perfect point in its name alone: indie publishing is a scrappy business even more than it is an open art form. Blushing and BRAVO! Thanks for your kind words. You bring up many more points. Bringing an indie book to market isn’t an impossible task. Daunting? Yes! Impossible? No! D.M. Kenyon, that was an excellent response and gives everyone food for thought. I agree with you. But the big publishers never did, and still don’t, provide their marketing muscle to all of the authors; in fact, they provide it to very few. Most traditionally published authors are even worse off than the indies–unless they’re the ones getting the support. The way I see it, indies face two big hurdles: getting into the bookstores, which will happen in time, and getting ‘visible.’ I think the getting visible is by far the bigger hurdle, and it’s going to take some innovation to conquer. It will happen though, and I think it will happen sooner rather than later. For the past couple of years indies have been lazy in innovation because (IMO) Amazon was offering them ways to become visible through KDP and free books resulting in their recommendation system getting those authors visibility. Now that they are cutting back on those, as well as many other things, indies are going to have to find new ways. It will take a while, but we’ll find them. Thanks for that thought-provoking comment, and as always, thanks to you, Naomi for getting us to think.